Recently I marked something off my bucket list: singing in public. Read my post about the Danger of a Bucket list. My plan for this event was to practice secretly with my musician friend, have him tell me if my singing was lousy, and if not, possibly just get up to sing with him one night at one of his regular gigs much to the surprise of my husband. Then to sit down as if nothing had happened and mentally scratch a line through "Sing in public" on my mental bucket list. That isn't at all what happened. The practices were revealed and then on vacation at the beach last fall our friend got out his guitar one night after we'd all had one too many at the Flora-Bama. I ended up singing my song in front of my husband as our other friend nodded off in a chair. When the song was finished I got a "Huh." So I put someone to sleep and got a huh. Clearly I'd bring down the house. Finally a date was set for my debut and I thought I was ready. My husband began telling everyone we saw "Hey, Michelle is singing with Glen at the Mellow Mushroom on the 29th. You should come." The first time I thought "Well, what's one more person." 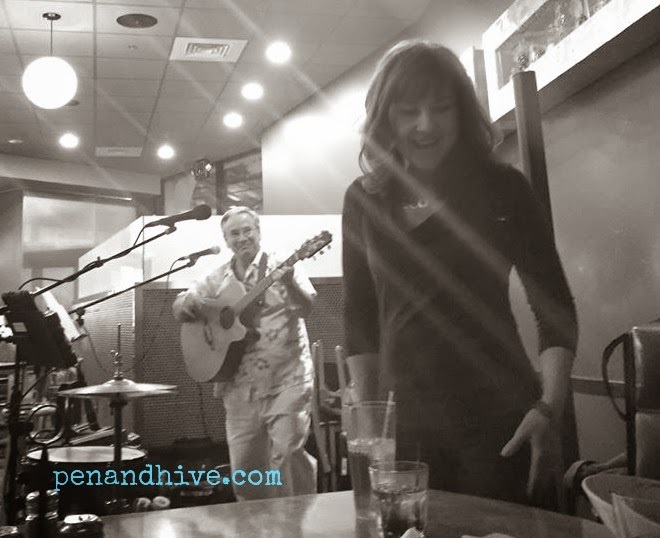 Far from the quiet semi-private experience of getting up and anonymously singing my song while strangers ate pizza and watched ESPN over the bar, I ended up with an attentive group of well wishers watching me sing a song with an old friend. This is what Jack Daniels is for. I ate with my friends who had arrived and my daughter and her husband. A couple of friends showed up that my husband had called that day as a surprise. "I couldn't just get up and do this quietly? You had to invite all these people?" "Why can't I be proud of you?" After the first set of songs and a couple of drinks I was ready. The guitar intro played and I started singing. At this point even though my singing skills are questionable, my acting skills kicked in. I just kept acting like I could sing. About half way through the song something in my head exploded like a giant gas filled balloon taking up all the brain space with throbbing pain. I kept smiling and singing. Then a guy in the back stood up and started waving his arms at me. I waved back with that full arm wave. The one you do when you go see your favorite band and they play that song you made out to in high school. If I'd been holding a lighter it would have been perfect. Except now I'm the fan of some random guy with a mouth full of pizza who is probably watching his team score on the flatscreen over the bar. I sang the last verse slightly confused by all that and a headache that felt like the balloon in my brain would burst any moment. Oh good. All my friends can be here when I die. And just like that the song was over. It took maybe 3 minutes or so. People clapped because that's what you do for crazy people. Think campaign rally. Nearly all clapping. If it was so un-fun and so uncomfortable what made me do it? Because the thing I am the most afraid of is lying in a bed at the end of my life thinking "I wish I had..." That is the scariest thing of all. There will probably be something on it still at that point but I am making the list as short as possible. Plus as the parent of adult kids I think I still have some lessons to teach. Among those are overcoming your fears and keep trying new things no matter how old you get. If you want to keep growing you have to keep doing the scary and uncomfortable thing. You have to keep pushing out of your comfort zone. You have to keep trying stuff. It's how you make an interesting life. Oh. You want to know the song, don't you? Mary Chapin Carpenter's Passionate Kisses. Here's how it's supposed to sound. There is nothing either good or bad but thinking makes it so. See the link below for more info.